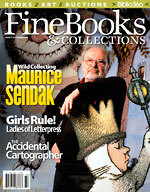 Lucky for collectors and scholars, Maurice Sendak was a saver. More than fifty years' worth of his artwork and manuscripts are on display in two exhibitions this summer. British author Thomas Hughes tried to build a utopia in rural Rugby, Tennessee. The experiment was largely unsuccessful, with one exception: his namesake library. An exhibit explores the intersection of fine art photography and book cover design.